While 98% of my photography business comes from Texas, I still like to experience other locations. I’ve been fortunate to spend summers in Colorado for the past 25 years – hiking 14ers, fly fishing remote streams, and hiking through fields of Colorado wildflowers. This past June and July were no exception. I’ll always take the opportunity to escape the dog days of a Texas summer and enjoy high temperatures in the 70s for a month or so. Granted, it is hard returning to Texas in August when my kids go back to school and the temps are consistently in the 100s. But I also know Texas is my home, and eventually October will bring cooler weather! This summer, I spent some time in Rocky Mountain National Park. Up above tree line, I found golden sunflowers (commonly called Old Man of the Mountain) blowing in the breeze, as well as bull elk enjoying a nice sunset. Golden sunflowers bloom on the high tundra and rocky slopes of Rocky Mountain National Park. These Colorado wildflowers are commonly known as “Old Man of the Mountain” and put on a show in the higher elevations during the mid summer months. Elk enjoy a lazy summer sunset in Colorado’s Rocky Mountain National Park. 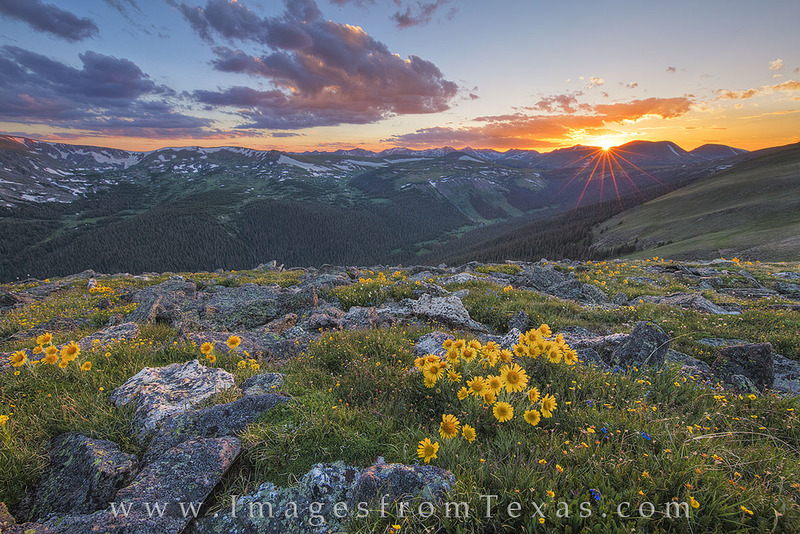 This photograph was taken in mid July at about 12,000 feet as the sun set in the west over the Rocky Mountains. The elk in the foreground sat there for 20 minutes, allowing me to photograph him from several angles. When I packed my camera and lenses, he stood up and strolled away. This sunflower image was a composite of 7 different images stacked together to achieve the best depth and sharpness possible. In the elk image, this regal creature sat there for 20 minutes while I patiently waited for the sun to hit the horizon (this gives you a nice sunburst with certain lenses – in this case an 11-24L). After the sun dipped below the mountain, I changed to a telephoto lens and took a few more close-ups of the elk. When I finished and began packing up. he also stood up and sauntered away. I guess he knew the photo shoot was over! I was photographing the aspen grove when I had a visitor look my way. To my surprise, this moose had walked up from Maroon Lake. I had seen him earlier in the morning, but hadn’t give him much thought since in several hours. I took a few quick shots then gave him free passage. There are so many place to explore in Colorado – long hikes to remote meadows filled with wildflowers; high mountain lakes with islands in the middle of the water; beautiful summits above 14,000 feet. Each year it is a new adventure. 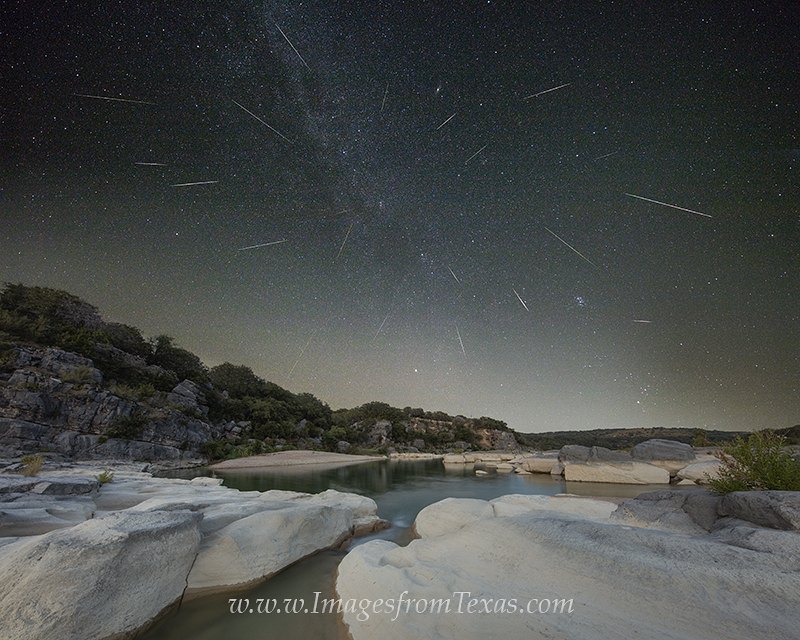 Now though, it is time to seek out more unique locations in Texas. The road never ends! Please feel free to peruse this gallery for my favorite Colorado Landscape and Wildflower Images. (Click on the highlighted text). Posted in Colorado Landscapes and Wildflowers and tagged colorado 14ers, colorado landscapes, colorado photos, colorado prints, colorado wildflowers on July 20, 2016 by Rob Greebon.